One of my favorite recipes is really a “non” recipe. Practically too simple, really, to even be written down! But I still want to share my recipe for Pan Roasted Cherry Tomatoes because they are one of my favorite sides. And they’re not only delicious, they take about 10 minutes to make. Pan Roasted Cherry Tomatoes are great in the summer when cherry tomatoes are at their peak, and nearly as good during the winter months. Cherry tomatoes are one of the few tomatoes that pack a ton of flavor, even off-season. 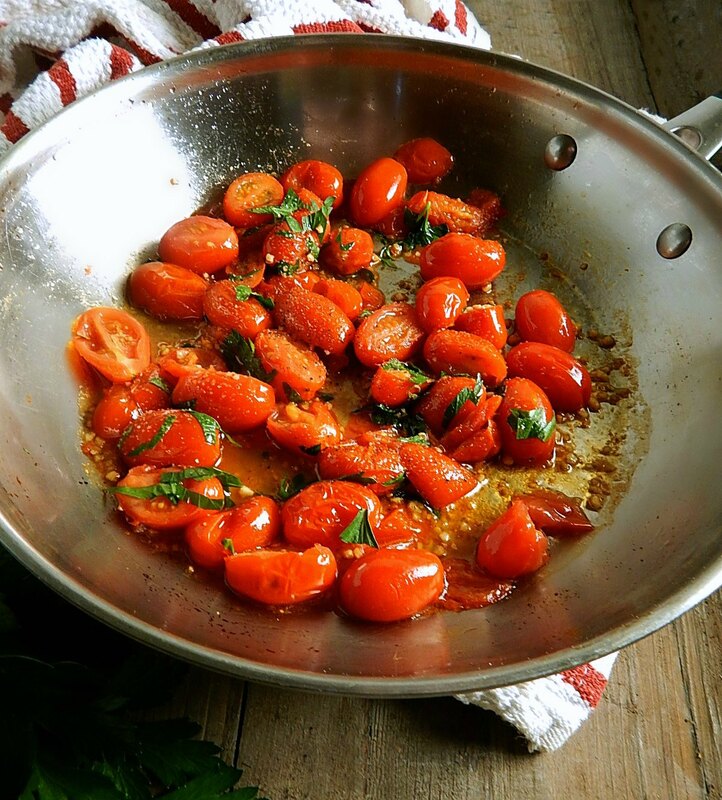 I love this quick little back pocket recipe for Pan Roasted Cherry Tomatoes. They make a great side for just about anything that’s served on its own – maybe a piece of fish like this Tilapia with Crusted Herb Topping or a nice chicken breast entree like Chicken Piccata. Make these tomatoes once and you’ll find all kinds of things you’ll want to serve them with. Now and then I’ll serve my Pan Roasted Cherry Tomatoes over a simple pasta – Angel hair cooks in minutes and lets you get dinner on the table in a hurry. Pasta can easily be picked up for under a dollar on sale, and combined with a coupon is dirt cheap. Talk about an inexpensive dinner!. Try tossing these fresh vibrant tomatoes, cold, in a green salad, maybe with an Italian dressing and shaves of Parmesan. Top crostini for a quick appetizer. They could even be tossed on top of a pizza. I also use a version of Pan Roasted Cherry Tomatoes in my Pasta with Tuna, Tomatoes, and Artichokes for another simple, inexpensive and absolutely scrumptious meal. Cleaning up the pans, or using foil? Something that I just wasn’t that into! Char – over and over we’re learning more about the char on foods and how unhealthy it is. The chemicals react in our bodies to form cancer-causing compounds. A Pan Roasted Cherry tomato solves all the above problems, ready in minutes they are still fresh, vibrant and flavorful! The sauce can be fortified with about a tablespoon of tomato paste if you’d like something thicker and more substantial. Simply push the tomatoes to the side of the pan, add the tomato paste and let cook for a moment then stir to combine with the juices and tomatoes. Now you’ve got double tomato flavor packed into that one simple dish. While I most often make Pan Roasted Cherry Tomatoes as a side, now and then I’ll serve it over a simple pasta – Angel hair cooks in minutes and lets you get dinner on the table in a hurry. Pasta can easily be picked up for under a dollar on sale, and combined with a coupon is dirt cheap. Talk about an inexpensive dinner! There is not a doubt that these specialty tomatoes cost more than a plain old tomato at the store, but there are some strategies for finding them at a great price. Since they come packaged, look for coupons (check your coupon site or the producer’s site) and they regularly go on sale in my area – often with a store coupon. (Yes, you can use both.) Check for great sales around any holiday, when they often go for half the regular sales price. Cut them as shown below in the photo. Simply place the lid of a yogurt, sour cream container, etc. upside down (lip up) on the counter, fill with whatever round objects you want to cut, place another lid lip down, press gently but firmly and slice horizontally through the center. I have a little strategy for buying olive oil – using coupons and sales to lower the price, so click on the link. I also look for new brands and stock up – heavy competition means that when a new brand comes to the store, it is often at a fantastic price for a few weeks, then settles in at around the same price as the others. I think it’s important to use olive oil as opposed to many others – the health benefits outweigh a bit of extra cost, and it can be had at a very reasonable price. I also like the fact that Olive oil contains no hidden trans fats like Canola or Vegetable oil. Salt and pepper, to taste, if desired. Heat olive oil in a saucepan over medium-high heat. Add cherry tomatoes and cook, stirring now and then until tomatoes begin to wrinkle just a bit, wilt and give off some juices. Add garlic and saute until heated through and fragrant, about a minute. Sprinkle with basil or oregano, salt, and pepper, as desired. Serve as a side or over pasta. Easily Cut Cherry Tomatoes, Grapes, Olives, Etc. Simply place the lid of a yogurt, sour cream container, etc. upside down (lip up) on the counter, fill with whatever round objects you want to cut, place another lid lip down, press gently but firmly and slice horizontally through the center. This entry was posted in Click here for Bargain Meals, Click here for Fabulous Food Posts and tagged Bargain Meal of the Week, Cherry Tomatoes, Italian, Pasta, Side, Tomatoes, Vegetable Side, Vegetarian Meal. Bookmark the permalink.